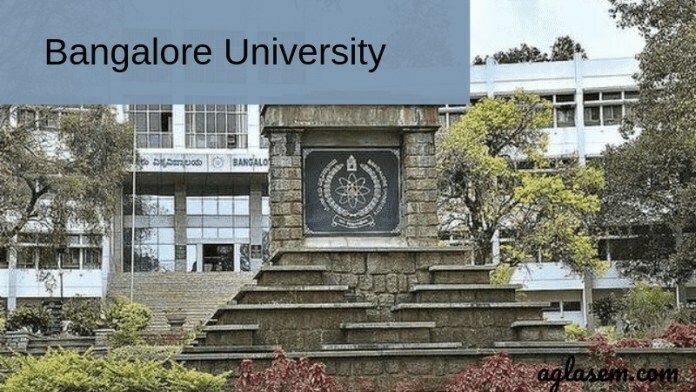 Bangalore University Time Table 2019 – Bangalore University releases the Exam Time Table for the university examinations online at the official website. Students can check Bangalore University Time Table to know the exam schedule for their subject. Bangalore University Exam Time Table holds information such as exam date, day, time, and subject name. It is students responsibility to check for any change or update related to the exam time table. To appear for the university semester exam, students have to submit the exam form and fees before the last date. Check the page for Bangalore University Time Table 2019. Latest: Bangalore University has released the timetable of B.Com (All Year), BBA, BA Course of DDE May 2019 Exam and revised timetable of 1st Sem B.Ed (CBCS) Degree Exam of April/May 2019. A student will be eligible to appear for the university semester exam if he/she maintains the minimum required attendance. The University will release the Hall Ticket for all the eligible students. It is important to carry the hall ticket and college id card on each day of the exam. Bangalore University Time Table are provided below. Time Table: Students can check Bangalore University Time Table at www.bangaloreuniversity.ac.in. The students pursuing in the Banglore University can check the semester examination Time Table through the official website. The link mentioned above can be used to check the Time Table. Follow the steps mentioned to check www.bangaloreuniversity.ac.in Bangalore Univesity Time Table. Check the information printed on the Bangalore University Time Table. Students appearing for the examination have to follow few important points related to the exam. Check the instructions provided below. Report to the assigned exam centre 15 minutes before the commencement of the exam. Carry your hall ticket and college id on each day of the exam. The Exam will commence as per the time mentioned on the hall ticket. No students will be allowed to leave the exam hall until the exam is over. Do not make any kind of mark on the answer booklet. Mobile Phone, Paper, book, programmable calculators, or any other form of material relevant to the subject of the exam (Theory / Practical0 in which the student is appearing is prohibited in the exam hall. Bangalore University releases the hall ticket for all the eligible students online. Students have to download the hall ticket and take the print of the same. Bangalore University Hall Ticket is an important document to carry on the day of the exam. No students will be entertained without the hall ticket. Students have to display their hall ticket when asked to do so. Do not write anything on the hall ticket.